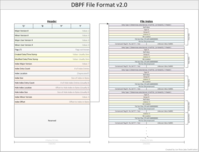 Database Packed File (DBPF) is a proprietary archive format used in many Maxis developed games, including The Sims 2, SimCity 4 and Spore. DBPF files are similar to Zip files, as they hold other files inside them which are usually compressed. All plugins for SimCity 4 (excluding the SC4 Extra Cheats.dll) are DBPF files, the file name's extension is irrelevant. Note that savegame (.sc4) files are also DBPF files. DBPF files are sometimes referred to as packages following the convention used in The Sims 2, where the files sometimes have the .package file extension. DBPF files can be identified by opening the file in notepad, or preferably a hex editor, as the first 4 characters/bytes will be the letters DBPF. If a file in the plugins folder does not start with these 4 letters the game will not load them, however the Reader will. This means that if you want to disable a plugin you can open the DBPF file in a hex editor and change the first byte to something other than 44 (in Hexadecimal) (D) and the game will not load the plugin, but you will still be able to edit it in the reader (saving the disabled plugin with the reader will not re enable it, to re enable you must change the first byte back to 44 (hexadecimal)). Entries may be compressed with RefPack/QFS compression depending on their entry data. For an examination of the Spore DBPF format, see Spore DBPF. Header first, individual files following with no file names and a small file header area at the beginning of each, followed by an index of all the files in the archive. Note that files may appear after the index table in files that are updated. 12 unknown 2.0 u32 Unused, possibly reserved. Can put data here. 20 unknown 2.0 u32 Should always be zero in DBPF 2.0. 32 Index major version < 2.0 u32 Always 7 in The Sims 2, Sim City 4. If this is used in 2.0, then it is 0 for SPORE. 36 Index entry count u32 Number of entries in the Index Table. 44 Index size u32 Size of the Index table, in bytes. 60 Index minor version < 2.0? u32 01 = 7.0, 02 = 7.1, Version 1.1+ in The Sims 2 only. In DBPF 2.0, it has a value of 03, unknown if used. 64 Index offset 2.0 u32 Offset to Index table in DBPF 2.0. 72 reserved char Reserved for use in future versions. There are two known formats of indexes in the game. The format version is found in the file header. Index Tables list the contents of the DBPF package, giving the information below depending on the Index Table version used. A third format has been discovered, and is used in The Sims 2, but the structure is currently unknown. The Index Minor Version is an actual zero, so this would be called "Index Table 7.-1" by the logic used here. This format has been seen in files that ship with that game, and is believed to have been seen in files generated by that game, but has not yet been seen in user-created files (for obvious reasons). These files were discovered by the simple expedient of having a file-scanning tool choke on them during a scan of the entire game. The index table is very similar to the directory file (DIR) within a DPBF package. The difference being that the Index Table lists every file in the package, whereas the directory file only lists the compressed files within the package. Reader presents a directory file that is a mashup of these two entities, listing every file in the package, as well as indicating whether or not that particular file is compressed. A Hole Table contains the location and size of all holes in a DBPF file. Holes are created when the game deletes something from a DBPF. The holes themselves are simply junk data of the appropriate length to fill the hole. 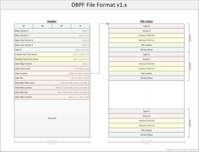 The files included in a DBPF file make up the bulk of the DBPF package. Each file is either uncompressed or compressed. To check if a file is compressed you first need to read the DIR file, if it exists. If no DIR entry exists, then no files within the package are compressed. The directory file (DIR) is included in DBPF files whenever there are compressed files within the package. When reading a DBPF file, the first thing you should do is check to see if any chunks inside are compressed. This is done via the DIR (E86B1EEF) resource. For example code and a description of the mechanics, see DBPF Compression. Raw data of the files, may be compressed or uncompressed. See List of File Formats for a list of the file types that may exist within a DBPF file. Check for a DIR record. Check for the file you want to extract. Is this file compressed? If so, decompress it. Read the file data and process accordingly. This page was last modified on 1 February 2013, at 12:16. This page has been accessed 47,780 times.